The latest hacking strategies include attacking targets from multiple fronts using DDoS attempts, malware and other techniques at the same time. Automation, including widespread use of compromised systems, hired botnets and IoT (Internet of Things) devices, is on the rise. Join us to learn more about multi-layered attacks and how intelligence and automation are making them significantly more powerful. You will also learn tips to help your organization mitigate the risks. · How bots are simplifying automation creating an even bigger volumetric attack force. · How DDoS attacks are often a smoke screen to other malware attacks happening. 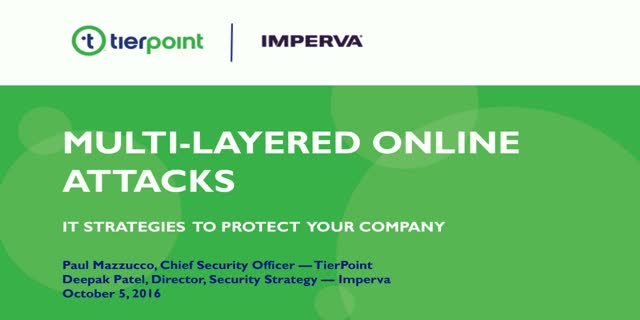 · Strategies for protecting your organization against multi-layer attacks.